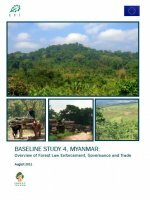 Myanmar remains one of the world’s only countries with no prohibitions on log exports. The country provides much coveted teak and other hardwood logs to the region and beyond. Sawn wood, and to a lesser extent finished wood products, contribute a relatively small amount to Myanmar’s total exports of wood products. As in the majority of Mekong countries, one of the most significant trends affecting forest lands in Myanmar relates to the considerable, and often times informal, foreign direct investments (FDI) in agribusiness plantations such as rubber, oil palm, timber plantation, cashew nut and other horticultural crops. FD are also being made in other resource sector developments, including hydropower and mineral extraction. These types of developments often require the clearing of natural forest areas and has led to land disputes with local communities.